LinkedIn Introduces New Security Site: LinkedIn just launched a new security site to help individuals and businesses easily understand their security practices. The site also provides quick access to tips on securing your LinkedIn account and their transparency report. Facebook Launches Riff, Collaborative Video Making Tool: Facebook’s new tool, Riff, lets users create videos with others. A user simply begins a video, gives it a topic and share it with friends who can add their clip. 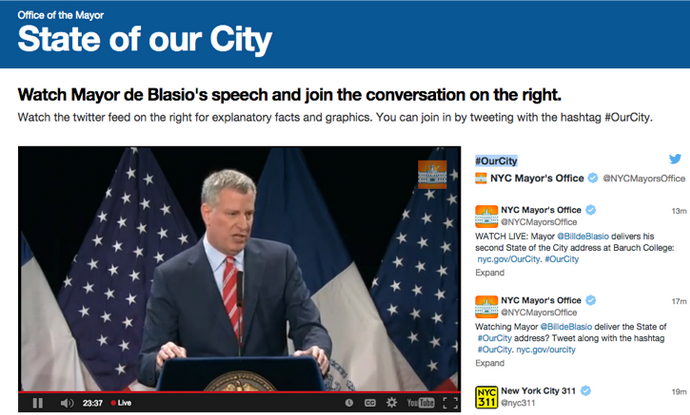 New York City’s Office of the Mayor used Curator to power a Twitter feed on nyc.gov during the 2015 State of our City speech. 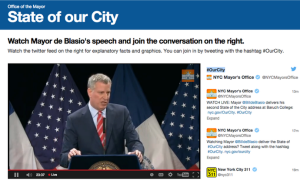 Courtesy of nyc.gov and the city of New York. Image via Twitter. Vine Releases Windows Phone Updates: Windows Phone owners who use Vine finally have a number of important updates long available on iOS and Android. The updates include the ability to import video from their camera, edit Vines, messaging, loop counts, redesigned activity feed, and ability to change their profile color.